Fentanyl transdermal system exposes patients and other users to the risks of opioid addiction, abuse, and misuse, which can lead to overdose and death. Assess each patient’s risk prior to prescribing fentanyl transdermal system, and monitor all patients regularly for the development of these behaviors and conditions [see Warnings and Precautions (5.1)]. Serious, life-threatening, or fatal respiratory depression may occur with use of fentanyl transdermal system. Monitor for respiratory depression, especially during initiation of fentanyl transdermal system or following a dose increase. Because of the risk of respiratory depression, fentanyl transdermal system is contraindicated for use as an as-needed analgesic, in non-opioid tolerant patients, in acute pain, and in postoperative pain [see Contraindications (4) and Warnings and Precautions (5.3)]. Accidental exposure to even one dose of fentanyl transdermal system, especially in children, can result in a fatal overdose of fentanyl. Deaths due to an overdose of fentanyl have occurred when children and adults were accidentally exposed to fentanyl transdermal system. Strict adherence to the recommended handling and disposal instructions is of the utmost importance to prevent accidental exposure [see Warnings and Precautions (5.4)]. Prolonged use of fentanyl transdermal system during pregnancy can result in neonatal opioid withdrawal syndrome, which may be life-threatening if not recognized and treated, and requires management according to protocols developed by neonatology experts. If opioid use is required for a prolonged period in a pregnant woman, advise the patient of the risk of neonatal opioid withdrawal syndrome and ensure that appropriate treatment will be available [see Warnings and Precautions (5.5)]. The concomitant use of fentanyl transdermal system with all cytochrome P450 3A4 inhibitors may result in an increase in fentanyl plasma concentrations, which could increase or prolong adverse drug effects and may cause potentially fatal respiratory depression. In addition, discontinuation of a concomitantly used cytochrome P450 3A4 inducer may result in an increase in fentanyl plasma concentration. Monitor patients receiving fentanyl transdermal system and any CYP3A4 inhibitor or inducer [see Warnings and Precautions (5.6) and Clinical Pharmacology (12.3)]. Exposure of the fentanyl transdermal system application site and surrounding area to direct external heat sources, such as heating pads or electric blankets, heat or tanning lamps, sunbathing, hot baths, saunas, hot tubs, and heated water beds may increase fentanyl absorption and has resulted in fatal overdose of fentanyl. Warn patients to avoid exposing the application site and surrounding area to direct external heat sources [see Warnings and Precautions (5.7)]. Use the lowest effective dosage for the shortest duration consistent with individual patient treatment goals ( 2.1). Monitor patients closely for respiratory depression, especially within the first 24-72 hours of initiating therapy with fentanyl transdermal system when serum concentrations from the initial patch will peak [see Warnings and Precautions (5.3)]. Table 1 should not be used to convert from fentanyl transdermal system to other therapies because this conversion to fentanyl transdermal system is conservative. Use of Table 1 for conversion to other analgesic therapies can overestimate the dose of the new agent. Overdosage of the new analgesic agent is possible [see Dosage and Administration (2.8)]. Convert this amount to the equianalgesic oral morphine dose using a reliable reference. Refer to Table 2 for the range of 24-hour oral morphine doses that are recommended for conversion to each fentanyl transdermal system dose. Use this table to find the calculated 24‑hour morphine dose and the corresponding recommended initial fentanyl transdermal system dose. Initiate fentanyl transdermal system treatment using the recommended dose and titrate patients upwards (no more frequently than 3 days after the initial dose and every 6 days thereafter) until analgesic efficacy is attained. A 37.5 mcg/hour dose may also be used. For patients that require more than 100 mcg/hour, several transdermal systems may be used. Do not use Table 2 to convert from fentanyl transdermal system to other therapies because this conversion to fentanyl transdermal system is conservative and will overestimate the dose of the new agent. For patients that may be more sensitive to the effects of opioids, additional intermediate strengths may be considered during conversion from prior opioids or titrating the dose of the fentanyl transdermal system. For example, rather than converting or titrating to a 50 mcg/hr system, a 37.5 mcg/hr system is available. Similarly a 62.5 mcg/hr system is available for use as an intermediate strength between the 50 mcg/hr and the 75 mcg/hr system, and an 87.5 mcg/hr system is available as an intermediate strength between the 75 mcg/hr system and the 100 mcg/hr system. The additional intermediate strengths, 37.5 mcg/hr, 62.5 mcg/hr and 87.5 mcg/hr, were not used in the clinical studies. It may take up to 6 days for fentanyl levels to reach equilibrium on a new dose [see Clinical Pharmacology (12.3)]. Therefore, evaluate patients for further titration after no less than two 3‑day applications before any further increase in dosage is made. Avoid the use of fentanyl transdermal system in patients with severe hepatic impairment. In patients with mild to moderate hepatic impairment, start with one half of the usual dosage of fentanyl transdermal system. Closely monitor for signs of respiratory and central nervous system depression, including at each dosage increase [see Warnings and Precautions (5.16), Use in Specific Populations (8.6) and Clinical Pharmacology (12.3)]. Avoid the use of fentanyl transdermal system in patients with severe renal impairment. In patients with mild to moderate renal impairment, start with one half of the usual dosage of fentanyl transdermal system. Closely monitor for signs of respiratory and central nervous system depression, including at each dosage increase [see Warnings and Precautions (5.17), Use in Specific Populations (8.7) and Clinical Pharmacology (12.3)]. Proper handling of fentanyl transdermal system is necessary in order to prevent serious adverse outcomes, including death, associated with accidental secondary exposure to fentanyl transdermal system [see Warnings and Precautions (5.4)]. Contact with unwashed or unclothed application sites can result in secondary exposure to fentanyl transdermal system and should be avoided. Examples of accidental exposure include transfer of a fentanyl transdermal system from an adult’s body to a child while hugging, sharing the same bed as the patient, accidental sitting on a patch and possible accidental exposure of a caregiver’s skin to the medication in the patch while applying or removing the patch. Instruct patients to avoid exposing the fentanyl transdermal system application site and surrounding area to direct external heat sources, such as heating pads or electric blankets, heat or tanning lamps, sunbathing, hot baths, saunas, hot tubs, and heated water beds, while wearing the system [see Warnings and Precautions (5.7)]. Failure to properly dispose of fentanyl transdermal system has resulted in accidental exposures and deaths, including deaths of children [see Warnings and Precautions (5.4)]. To convert patients to another opioid, remove fentanyl transdermal system and titrate the dose of the new analgesic based upon the patient’s report of pain until adequate analgesia has been attained. Upon system removal, 17 hours or more are required for a 50% decrease in serum fentanyl concentrations. Withdrawal symptoms are possible in some patients after conversion or dose adjustment [see Warnings and Precautions (5.20)]. When discontinuing fentanyl transdermal system and not converting to another opioid, use a gradual downward titration, such as a 50% dosage reduction every 6 days, while monitoring carefully for signs and symptoms of withdrawal. If the patient develops these signs or symptoms, raise the dose to the previous level and taper more slowly, either by increasing the interval between decreases, decreasing the amount of change in dose, or both. Do not abruptly discontinue fentanyl transdermal system [see Warnings and Precautions (5.20), Drug Abuse and Dependence (9.3)]. It is not known at what dose level fentanyl transdermal system may be discontinued without producing the signs and symptoms of opioid withdrawal. Fentanyl Transdermal System is available as 12 mcg/hour*, 25 mcg/hour, 37.5 mcg/hour, 50 mcg/hour, 62.5 mcg/hour, 75 mcg/hour, 87.5 mcg/hour or 100 mcg/hour of fentanyl. 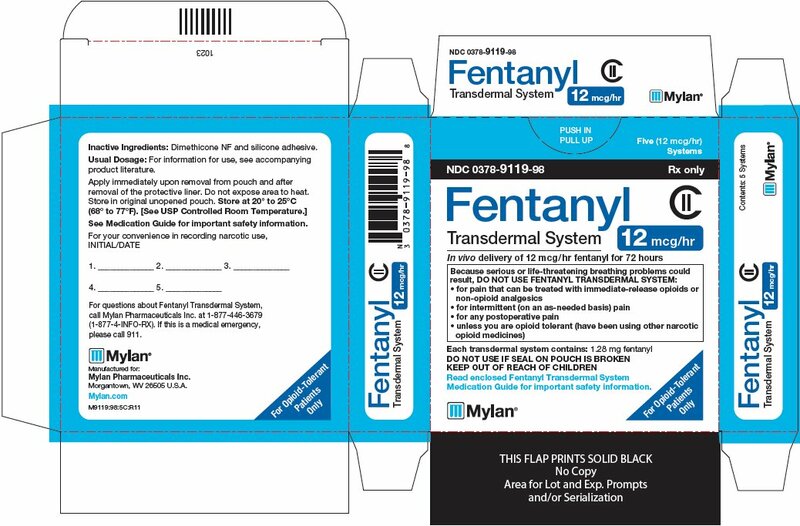 The 12 mcg/hour* (system size 3.13 cm 2) transdermal system consists of a translucent rectangular patch with rounded corners, printed with “Fentanyl 12 mcg/hr” and diagonal stripes in blue ink, on a removable release liner. The patch is overlaid and underlaid with additional release liners, and is contained in a square pouch. The pouch is labeled with the lot number and expiration date. The 25 mcg/hour (system size 6.25 cm 2) transdermal system consists of a translucent rectangular patch with rounded corners, printed with “Fentanyl 25 mcg/hr” and diagonal stripes in blue ink, on a removable release liner. The patch is overlaid and underlaid with additional release liners, and is contained in a square pouch. The pouch is labeled with the lot number and expiration date. The 37.5 mcg/hour (system size 9.38 cm 2) transdermal system consists of a translucent rectangular patch with rounded corners, printed with “Fentanyl 37.5 mcg/hr” and diagonal stripes in blue ink, on a removable release liner. The patch is overlaid and underlaid with additional release liners, and is contained in a square pouch. The pouch is labeled with the lot number and expiration date. 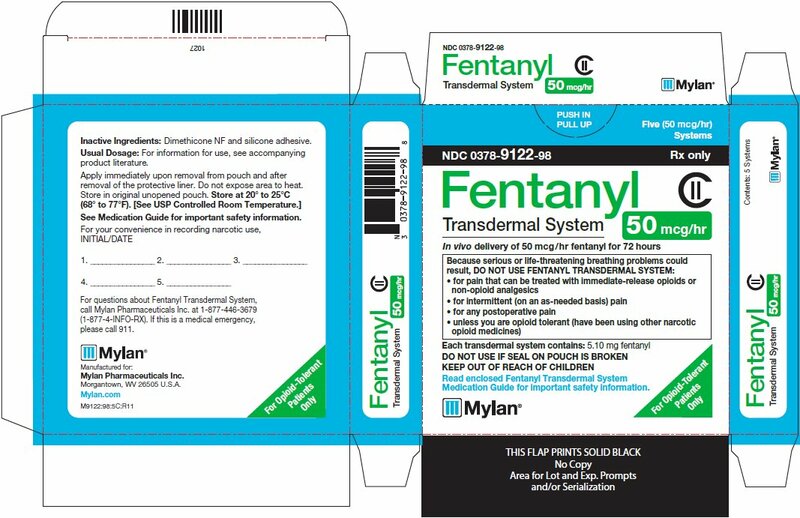 The 50 mcg/hour (system size 12.5 cm 2) transdermal system consists of a translucent rectangular patch with rounded corners, printed with “Fentanyl 50 mcg/hr” and diagonal stripes in blue ink, on a removable release liner. The patch is overlaid and underlaid with additional release liners, and is contained in a square pouch. The pouch is labeled with the lot number and expiration date. The 62.5 mcg/hour (system size 15.63 cm 2) transdermal system consists of a translucent rectangular patch with rounded corners, printed with “Fentanyl 62.5 mcg/hr” and diagonal stripes in blue ink, on a removable release liner. The patch is overlaid and underlaid with additional release liners, and is contained in a square pouch. The pouch is labeled with the lot number and expiration date. The 75 mcg/hour (system size 18.75 cm 2) transdermal system consists of a translucent rectangular patch with rounded corners, printed with “Fentanyl 75 mcg/hr” and diagonal stripes in blue ink, on a removable release liner. The patch is overlaid and underlaid with additional release liners, and is contained in a square pouch. The pouch is labeled with the lot number and expiration date. The 87.5 mcg/hour (system size 21.88 cm 2) transdermal system consists of a translucent rectangular patch with rounded corners, printed with “Fentanyl 87.5 mcg/hr” and diagonal stripes in blue ink, on a removable release liner. The patch is overlaid and underlaid with additional release liners, and is contained in a square pouch. The pouch is labeled with the lot number and expiration date. 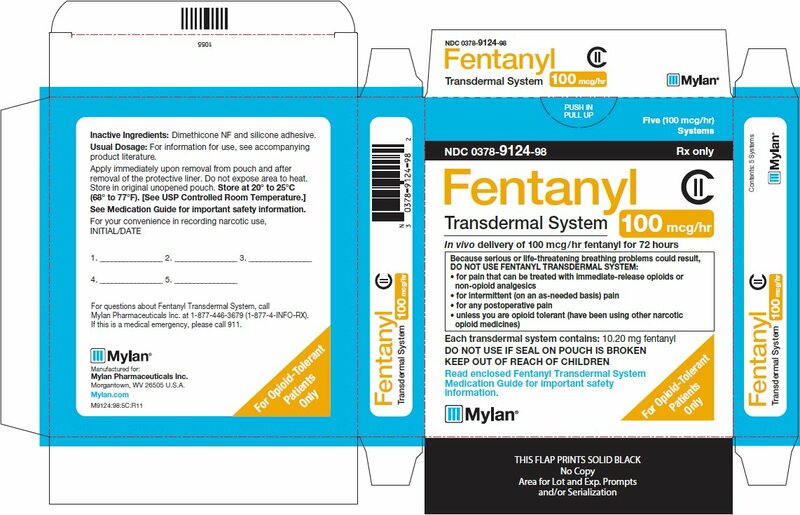 The 100 mcg/hour (system size 25 cm 2) transdermal system consists of a translucent rectangular patch with rounded corners, printed with “Fentanyl 100 mcg/hr” and diagonal stripes in blue ink, on a removable release liner. The patch is overlaid and underlaid with additional release liners, and is contained in a square pouch. The pouch is labeled with the lot number and expiration date. *This lowest strength is designated as 12 mcg/hour (however, the actual strength is 12.5 mcg/hour) to distinguish it from a possible 125 mcg/hour dosage that could be prescribed by using multiple transdermal systems. patients with significant respiratory depression [see Warnings and Precautions (5.10)]. Assess each patient’s risk for opioid addiction, abuse, or misuse prior to prescribing fentanyl transdermal system, and monitor all patients receiving fentanyl transdermal system for the development of these behaviors and conditions. Risks are increased in patients with a personal or family history of substance abuse (including drug or alcohol abuse or addiction) or mental illness (e.g., major depression). The potential for these risks should not, however, prevent the proper management of pain in any given patient. Patients at increased risk may be prescribed opioids such as fentanyl transdermal system, but use in such patients necessitates intensive counseling about the risks and proper use of fentanyl transdermal system along with intensive monitoring for signs of addiction, abuse, and misuse. Fentanyl transdermal system is indicated only in opioid tolerant patients because of the risk for respiratory depression and death. While serious, life-threatening, or fatal respiratory depression can occur at any time during the use of fentanyl transdermal system, the risk is greatest during the initiation of therapy or following a dosage increase. Monitor patients closely for respiratory depression within the first 24-72 hours of initiating therapy with and following dosage increases of fentanyl transdermal system. Concomitant use of fentanyl transdermal system with a CYP3A4 inhibitor, such as macrolide antibiotics (e.g., erythromycin), azole-antifungal agents (e.g., ketoconazole), and protease inhibitors (e.g., ritonavir), may increase plasma concentrations of fentanyl and prolong opioid adverse reactions, which may cause potentially fatal respiratory depression [see Warnings and Precautions (5.3)], particularly when an inhibitor is added after a stable dose of fentanyl transdermal system is achieved. Similarly, discontinuation of a CYP3A4 inducer, such as rifampin, carbamazepine, and phenytoin, in fentanyl transdermal system-treated patients may increase fentanyl plasma concentrations and prolong opioid adverse reactions. When using fentanyl transdermal system with CYP3A4 inhibitors or discontinuing CYP3A4 inducers in fentanyl transdermal system-treated patients, monitor patients closely at frequent intervals and consider dosage reduction of fentanyl transdermal system until stable drug effects are achieved [see Dosage and Administration (2.3), Drug Interactions (7)]. Fentanyl transdermal system-treated patients with significant chronic obstructive pulmonary disease or cor pulmonale, and those with a substantially decreased respiratory reserve, hypoxia, hypercapnia, or pre-existing respiratory depression are at increased risk of decreased respiratory drive including apnea, even at recommended dosages of fentanyl transdermal system [see Warnings and Precautions (5.3)]. Monitor such patients closely, particularly when initiating and titrating fentanyl transdermal system and when fentanyl transdermal system is given concomitantly with other drugs that depress respiration [see Warnings and Precautions (5.3)]. Alternatively, consider the use of non-opioid analgesics in these patients. A clinical pharmacology study with intravenous fentanyl in patients undergoing kidney transplantation has shown that patients with high blood urea nitrogen level had low fentanyl clearance. Because of the long half-life of fentanyl when administered as fentanyl transdermal system, avoid the use of fentanyl transdermal system in patients with severe renal impairment. Insufficient information exists to make precise dosing recommendations regarding the use of fentanyl transdermal system in patients with impaired renal function. Therefore, to avoid starting patients with mild to moderate renal impairment on too high of a dose, start with one half of the usual dosage of fentanyl transdermal system. Closely monitor for signs of sedation and respiratory depression, including at each dosage increase [see Dosage and Administration (2.5), Use in Specific Populations (8.7) and Clinical Pharmacology (12.3)]. The most common adverse reactions (≥ 5%) in a double-blind, randomized, placebo-controlled clinical trial in patients with severe pain were nausea, vomiting, somnolence, dizziness, insomnia, constipation, hyperhidrosis, fatigue, feeling cold, and anorexia. Other common adverse reactions (≥ 5%) reported in clinical trials in patients with chronic malignant or nonmalignant pain were headache and diarrhea. Adverse reactions reported for ≥ 1% of fentanyl transdermal system-treated patients and with an incidence greater than placebo-treated patients are shown in Table 3. Adverse reactions not reported in Table 3 that were reported by ≥ 1% of fentanyl transdermal system-treated adult and pediatric patients (N = 1854) in 11 controlled and uncontrolled clinical trials of fentanyl transdermal system used for the treatment of chronic malignant or nonmalignant pain are shown in Table 4. Pediatrics: The safety of fentanyl transdermal system was evaluated in three open-label trials in 289 pediatric patients with chronic pain, 2 years of age through 18 years of age. Adverse reactions reported by ≥ 1% of fentanyl transdermal system-treated pediatric patients are shown in Table 5. The concomitant use of fentanyl transdermal system and CYP3A4 inhibitors can increase the plasma concentration of fentanyl, resulting in increased or prolonged opioid effects particularly when an inhibitor is added after a stable dose of fentanyl transdermal system is achieved [see Warnings and Precautions (5.6)]. The concomitant use of fentanyl transdermal system and CYP3A4 inducers can decrease the plasma concentration of fentanyl [see Clinical Pharmacology (12.3)], resulting in decreased efficacy or onset of a withdrawal syndrome in patients who have developed physical dependence to fentanyl [see Warnings and Precautions (5.6)]. The concomitant use of opioids with other drugs that affect the serotonergic neurotransmitter system has resulted in serotonin syndrome [see Warnings and Precautions (5.11)]. MAOI interactions with opioids may manifest as serotonin syndrome [see Warnings and Precautions (5.11)] or opioid toxicity (e.g., respiratory depression, coma). Prolonged use of opioid analgesics during pregnancy may cause neonatal opioid withdrawal syndrome [see Warnings and Precautions (5.5)]. Available data with fentanyl transdermal system in pregnant women are insufficient to inform a drug-associated risk for major birth defects and miscarriage. No evidence of malformations or adverse effects on the fetus was reported in a published study in which pregnant rats were administered fentanyl continuously via subcutaneously implanted osmotic minipumps at doses of 10, 100, or 500 mcg/kg/day starting 2‑weeks prior to breeding and throughout pregnancy. The high dose was approximately 2 times the daily human dose administered by a 100 mcg/h patch on a mg/m2 basis). Monitor infants exposed to fentanyl transdermal system through breast milk for excess sedation and respiratory depression. Withdrawal symptoms can occur in breastfed infants when maternal administration of an opioid analgesic is stopped, or when breastfeeding is stopped. Due to effects of androgen deficiency, chronic use of opioids may cause reduced fertility in females and males of reproductive potential. It is not known whether these effects on fertility are reversible [see Adverse Reactions (6.2), Clinical Pharmacology (12.2), Nonclinical Toxicology (13.1)]. The safety of fentanyl transdermal system was evaluated in three open-label trials in 289 pediatric patients with chronic pain, 2 years of age through 18 years of age. Starting doses of 25 mcg/h and higher were used by 181 patients who had been on prior daily opioid doses of at least 45 mg/day of oral morphine or an equianalgesic dose of another opioid. Initiation of fentanyl transdermal system therapy in pediatric patients taking less than 60 mg/day of oral morphine or an equianalgesic dose of another opioid has not been evaluated in controlled clinical trials. To guard against excessive exposure to fentanyl transdermal system by young children, advise caregivers to strictly adhere to recommended fentanyl transdermal system application and disposal instructions [see Dosage and Administration (2.6), (2.7) and Warnings and Precautions (5.4)]. Respiratory depression is the chief risk for elderly patients treated with opioids, and has occurred after large initial doses were administered to patients who were not opioid-tolerant or when opioids were co-administered with other agents that depress respiration. Titrate the dosage of fentanyl transdermal system slowly in geriatric patients and monitor closely for signs of central nervous system and respiratory depression [see Warnings and Precautions (5.10)]. The effect of hepatic impairment on the pharmacokinetics of fentanyl transdermal system has not been fully evaluated. A clinical pharmacology study with fentanyl transdermal system in patients with cirrhosis has shown that systemic fentanyl exposure increased in these patients. Because there is in vitro and in vivo evidence of extensive hepatic contribution to the elimination of fentanyl transdermal system, hepatic impairment would be expected to have significant effects on the pharmacokinetics of fentanyl transdermal system. Avoid use of fentanyl transdermal system in patients with severe hepatic impairment [see Dosage and Administration (2.4), Warnings and Precautions (5.16) and Clinical Pharmacology (12.3)]. The effect of renal impairment on the pharmacokinetics of fentanyl transdermal system has not been fully evaluated. A clinical pharmacology study with intravenous fentanyl in patients undergoing kidney transplantation has shown that patients with high blood urea nitrogen level had low fentanyl clearance. Because there is in vivo evidence of renal contribution to the elimination of fentanyl transdermal system, renal impairment would be expected to have significant effects on the pharmacokinetics of fentanyl transdermal system. Avoid the use of fentanyl transdermal system in patients with severe renal impairment [see Dosage and Administration (2.5), Warnings and Precautions (5.17) and Clinical Pharmacology (12.3)]. “Drug seeking” behavior is very common in persons with substance use disorders. Drug-seeking tactics include emergency calls or visits near the end of office hours, refusal to undergo appropriate examination, testing or referral, repeated “loss” of prescriptions, tampering with prescriptions, and reluctance to provide prior medical records or contact information for other treating healthcare providers. “Doctor shopping” (visiting multiple prescribers to obtain additional prescriptions) is common among drug abusers and people suffering from untreated addiction. Preoccupation with achieving adequate pain relief can be appropriate behavior in a patient with poor pain control. Fentanyl transdermal system is intended for transdermal use only. Abuse of fentanyl transdermal system poses a risk of overdose and death. This risk is increased with concurrent abuse of fentanyl transdermal system with alcohol and other central nervous system depressants [see Warnings and Precautions (5.8) and Drug Interactions (7)]. Intentional compromise of the transdermal delivery system may result in the uncontrolled delivery of fentanyl and pose a significant risk to the abuser that could result in overdose and death [see Warnings and Precautions (5.1)]. Abuse may occur by applying the transdermal system in the absence of legitimate purpose, or by swallowing, snorting or injecting fentanyl extracted from the transdermal system. Clinical Presentation: Acute overdose with fentanyl transdermal system can be manifested by respiratory depression, somnolence progressing to stupor or coma, skeletal muscle flaccidity, cold and clammy skin, constricted pupils, and, in some cases, pulmonary edema, bradycardia, hypotension, partial or complete airway obstruction, atypical snoring, and death. Marked mydriasis rather than miosis may be seen with hypoxia in overdose situations [see Clinical Pharmacology (12.2)]. Treatment of Overdose: Give primary attention to the reestablishment of a patent airway and institution of assisted or controlled ventilation, if needed. Employ other supportive measures (including oxygen and vasopressors) in the management of circulatory shock and pulmonary edema as indicated. Cardiac arrest or arrhythmias will require advanced life support techniques. Once stable, ensure examine the patient and ensure that all fentanyl transdermal systems have been removed. Because the duration of opioid reversal is expected to be less than the duration of action of fentanyl in fentanyl transdermal system, carefully monitor the patient until spontaneous respiration is reliably reestablished. 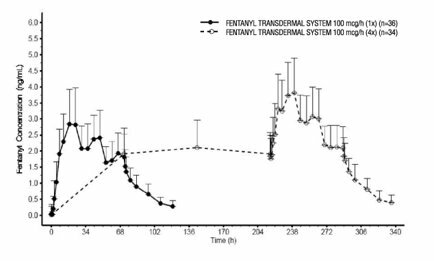 After fentanyl transdermal system removal, serum fentanyl concentrations decline gradually, falling about 50% in approximately 20-27 hours. Therefore, management of an overdose must be monitored accordingly, at least 72 to 96 hours beyond the overdose. The system contains fentanyl, an opioid agonist, for transdermal administration. The amount of fentanyl released from each system per hour is proportional to the surface area (25 mcg/hour per 6.25 cm2). The composition per unit area of all system sizes is identical. The molecular weight of fentanyl base is 336.5, and the molecular formula is C22H28N2O. The n‑octanol: water partition coefficient is 860:1. The pKa is 8.4. Fentanyl transdermal system is a rectangular translucent system with rounded corners. “Fentanyl”, dosage strength and diagonal lines are printed in blue ink on each system. 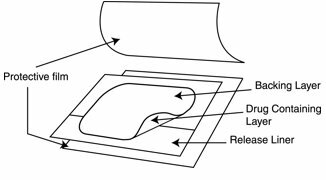 1) a backing layer of translucent polyolefin film with blue print; 2) a drug-in-adhesive layer containing fentanyl as the active ingredient and dimethicone NF and silicone adhesive as inactive ingredients. Before use, a polyester release liner covering the drug-in-adhesive layer is removed and discarded. Fentanyl transdermal system is a drug-in-adhesive matrix designed formulation. Fentanyl is released from the matrix at a nearly constant amount per unit time. The concentration gradient existing between the matrix and the lower concentration in the skin, drives drug release. Fentanyl moves in the direction of the lower concentration at a rate determined by the matrix and the diffusion of fentanyl through the skin layers. While the actual rate of fentanyl delivery to the skin varies over the 72-hour application period, each system is labeled with a nominal flux which represents the average amount of drug delivered to the systemic circulation per hour across average skin. While there is variation in dose delivered among patients, the nominal flux of the systems (12.5, 25, 37.5, 50, 62.5, 75, 87.5, and 100 mcg of fentanyl per hour) is sufficiently accurate as to allow individual titration of dosage for a given patient. After system removal, serum fentanyl concentrations decline gradually, falling about 50% in approximately 20-27 hours. Continued absorption of fentanyl from the skin accounts for a slower disappearance of the drug from the serum than is seen after an IV infusion, where the apparent half-life is approximately 7 (range 3-12) hours. NOTE: After system removal there is continued systemic absorption from residual fentanyl in the skin so that serum concentrations fall 50%, on average, in approximately 20-27 hours. Fentanyl plasma protein binding capacity decreases with increasing ionization of the drug. Alterations in pH may affect its distribution between plasma and the central nervous system. Fentanyl accumulates in the skeletal muscle and fat and is released slowly into the blood. The average volume of distribution for fentanyl is 6 L/kg (range 3-8; N = 8). Fentanyl is metabolized primarily via human cytochrome P450 3A4 isoenzyme system. In humans, the drug appears to be metabolized primarily by oxidative N‑dealkylation to norfentanyl and other inactive metabolites that do not contribute materially to the observed activity of the drug. Data from intravenous studies with fentanyl suggest that the elderly patients may have reduced clearance and a prolonged half-life. Moreover elderly patients may be more sensitive to the active substance than younger patients. A study conducted with the fentanyl transdermal system in elderly patients demonstrated that fentanyl pharmacokinetics did not differ significantly from young adult subjects, although peak serum concentrations tended to be lower and mean half-life values were prolonged to approximately 34 hours. In this study, a single fentanyl transdermal system 100 mcg/hour patch was applied to a skin site on the upper outer arm in a group of healthy elderly Caucasians ≥ 65 years old (n = 21, mean age 71 years) and worn for 72 hours. The mean Cmax and AUC∞ values were approximately 8% lower and 7% higher, respectively, in the elderly subjects as compared with subjects 18 to 45 years old. Inter-subject variability in AUC∞ was higher in elderly subjects than in healthy adult subjects 18 to 45 years (58% and 37%, respectively). The mean half-life value was longer in subjects ≥ 65 years old than in subjects 18 to 45 years old (34.4 hours versus 23.5 hours) [see Warnings and Precautions (5.10) and Use in Specific Populations (8.5)]. Because there is in vitro and in vivo evidence of extensive hepatic contribution to the elimination of fentanyl transdermal system, hepatic impairment would be expected to have significant effects on the pharmacokinetics of fentanyl transdermal system. Avoid use of fentanyl transdermal system in patients with severe hepatic impairment [see Dosing and Administration (2.4), Warnings and Precautions (5.16), and Use in Specific Populations (8.6)]. Because there is in vivo evidence of renal contribution to the elimination of fentanyl transdermal system, renal impairment would be expected to have significant effects on the pharmacokinetics of fentanyl transdermal system. Avoid the use of fentanyl transdermal system in patients with severe renal impairment [see Dosing and Administration (2.5), Warnings and Precautions (5.17) and Use in Specific Populations (8.7)]. 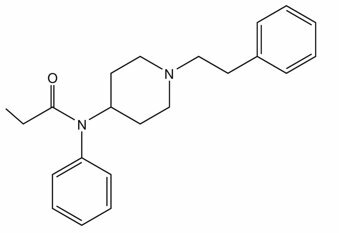 Fentanyl is metabolized mainly via the human cytochrome P450 3A4 isoenzyme system (CYP3A4). The interaction between ritonavir, a CPY3A4 inhibitor, and fentanyl was investigated in eleven healthy volunteers in a randomized crossover study. Subjects received oral ritonavir or placebo for 3 days. The ritonavir dose was 200 mg three times a day on Day 1 and 300 mg three times a day on Day 2 followed by one morning dose of 300 mg on Day 3. On Day 2, fentanyl was given as a single IV dose at 5 mcg/kg two hours after the afternoon dose of oral ritonavir or placebo. Naloxone was administered to counteract the side effects of fentanyl. The results suggested that ritonavir might decrease the clearance of fentanyl by 67%, resulting in a 174% (range 52%-420%) increase in fentanyl AUC0-∞. The concomitant use of transdermal fentanyl with all CYP3A4 inhibitors (such as ritonavir, ketoconazole, itraconazole, troleandomycin, clarithromycin, nelfinavir, nefazadone, amiodarone, amprenavir, aprepitant, diltiazem, erythromycin, fluconazole, fosamprenavir, verapamil, or grapefruit juice) may result in an increase in fentanyl plasma concentrations, which could increase or prolong adverse drug effects and may cause potentially fatal respiratory depression. Carefully monitor patients receiving fentanyl transdermal system and any CYP3A4 inhibitor for signs of respiratory depression for an extended period of time and adjust the dosage if warranted [see Boxed Warning and Warnings and Precautions (5.6), and Drug Interactions (7)]. In a two-year carcinogenicity study conducted in rats, fentanyl was not associated with an increased incidence of tumors at subcutaneous doses up to 33 mcg/kg/day in males or 100 mcg/kg/day in females (0.16 and 0.39 times the human daily exposure obtained via the 100 mcg/h patch based on AUC0-24h comparison). Fentanyl transdermal system as therapy for pain due to cancer has been studied in 153 patients. In this patient population, fentanyl transdermal system has been administered in doses of 25 mcg/h to 600 mcg/h. Individual patients have used fentanyl transdermal system continuously for up to 866 days. At one month after initiation of fentanyl transdermal system therapy, patients generally reported lower pain intensity scores as compared to a pre-study analgesic regimen of oral morphine. In the pediatric population, the safety of fentanyl transdermal system has been evaluated in 289 patients with chronic pain 2-18 years of age. The duration of fentanyl transdermal system use varied; 20% of pediatric patients were treated for ≤ 15 days; 46% for 16-30 days; 16% for 31-60 days; and 17% for at least 61 days. Twenty-five patients were treated with fentanyl transdermal system for at least 4 months and 9 patients for more than 9 months. Fentanyl Transdermal System is supplied in cartons containing 5 individually packaged systems. *This lowest strength is designated as 12 mcg/hour (however, the actual strength is 12.5 mcg/hour) to distinguish it from a 125 mcg/hour strength that could be prescribed by using multiple transdermal systems. Addiction, Abuse, and Misuse: Inform patients that the use of fentanyl transdermal system, even when taken as recommended, can result in addiction, abuse, and misuse, which can lead to overdose and death [see Warnings and Precautions (5.1)]. Instruct patients not to share fentanyl transdermal system with others and to take steps to protect fentanyl transdermal system from theft or misuse. Life-Threatening Respiratory Depression: Inform patients of the risk of life-threatening respiratory depression, including information that the risk is greatest when starting fentanyl transdermal system or when the dosage is increased, and that it can occur even at recommended dosages [see Warnings and Precautions (5.3)]. Advise patients how to recognize respiratory depression and to seek medical attention if breathing difficulties develop. Accidental Exposure: Inform patients that accidental exposure, especially in children, may result in respiratory depression or death [see Warnings and Precautions (5.4)]. Instruct patients to take steps store fentanyl transdermal system securely and to dispose of unused fentanyl transdermal system by flushing down the toilet [see Dosage and Administration (2.7)]. Disposal: Instruct patients to refer to the Instructions for Use for proper disposal of fentanyl transdermal system. To properly dispose of a used patch, instruct patients to remove it, fold so that the adhesive side of the patch adheres to itself, and immediately flush down the toilet. Unused patches should be removed from their pouches, the release liners removed, the patches folded so that the adhesive side of the patch adheres to itself, and immediately flushed down the toilet. Interactions with Benzodiazepines and Other CNS Depressants: Inform patients and caregivers that potentially fatal additive effects may occur if fentanyl transdermal system is used with benzodiazepines or other CNS depressants, including alcohol, and not to use these concomitantly unless supervised by a healthcare provider [see Warnings and Precautions (5.8), Drug Interactions (7)]. Serotonin Syndrome: Inform patients that opioids could cause a rare but potentially life-threatening condition resulting from concomitant administration of serotonergic drugs. Warn patients of the symptoms and signs of serotonin syndrome, and to seek medical attention right away if symptoms develop. Instruct patients to inform their healthcare providers if they are taking, or plan to take serotonergic medications [see Warnings and Precautions (5.11) and Drug Interactions (7)]. MAOI Interaction: Inform patients to avoid taking fentanyl transdermal system while using any drugs that inhibit monoamine oxidase. Patients should not start MAOIs while taking fentanyl transdermal system [see Drug Interactions (7)]. Adrenal Insufficiency: Inform patients that opioids could cause adrenal insufficiency, a potentially life-threatening condition. Adrenal insufficiency may present with non-specific symptoms and signs such as nausea, vomiting, anorexia, fatigue, weakness, dizziness, and low blood pressure. Advise patients to seek medical attention if they experience a constellation of these symptoms [see Warnings and Precautions (5.12)]. Important Administration Instructions: Advise patients never to change the dose of fentanyl transdermal system or the number of patches applied to the skin unless instructed to do so by the prescribing healthcare professional. avoid exposing the fentanyl transdermal system application site and surrounding area to direct external heat sources including heating pads, electric blankets, sunbathing, heat or tanning lamps, saunas, hot tubs or hot baths, and heated water beds. Hypotension: Inform patients that fentanyl transdermal system may cause orthostatic hypotension and syncope. Instruct patients how to recognize symptoms of low blood pressure and how to reduce the risk of serious consequences should hypotension occur (e.g., sit or lie down, carefully rise from a sitting or lying position) [see Warnings and Precautions (5.13)]. Anaphylaxis: Inform patients that anaphylaxis, including anaphylactic shock, has been reported with ingredients contained in fentanyl transdermal system. Advise patients how to recognize such a reaction and when to seek medical attention [see Contraindications (4), Adverse Reactions (6)]. Pregnancy: Neonatal Opioid Withdrawal Syndrome: Inform female patients of reproductive potential that prolonged use of fentanyl transdermal system during pregnancy can result in neonatal opioid withdrawal syndrome, which may be life-threatening if not recognized and treated [see Warnings and Precautions (5.5), Use in Specific Populations (8.1)]. Embryo-Fetal Toxicity: Inform female patients of reproductive potential that fentanyl can cause fetal harm and to inform their healthcare provider of known or suspected pregnancy [see Use in Specific Populations (8.1)]. Lactation: Advise patients that breastfeeding is not recommended during treatment with fentanyl transdermal system [see Use in Specific Populations (8.2)]. Infertility: Inform patients that chronic use of opioids may cause reduced fertility. It is not known whether these effects on fertility are reversible [see Use in Specific Populations (8.3)]. Driving or Operating Heavy Machinery: Inform patients that fentanyl transdermal system may impair the ability to perform potentially hazardous activities such as driving a car or operating heavy machinery. Advise patients not to perform such tasks until they know how they will react to the medication [see Warnings and Precautions (5.21)]. Constipation: Advise patients of the potential for severe constipation, including management instructions and when to seek medical attention [see Adverse Reactions (6), Clinical Pharmacology (12.2)]. Get emergency help right away if you use too many fentanyl transdermal systems (overdose). When you first start taking fentanyl transdermal system, when your dose is changed, or if you use too many (overdose), serious or life threatening breathing problems that can lead to death may occur. Be sure that you read, understand, and follow these Instructions for Use before you apply fentanyl transdermal system (patch). Talk to your healthcare provider or pharmacist if you have any questions. 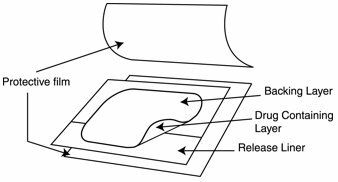 Fentanyl transdermal system is a rectangular, translucent patch with rounded corners. The product’s active ingredient name, “Fentanyl”, and dosage strength are randomly printed in blue on each patch. All of the patches have blue diagonal stripes. Fentanyl transdermal systems are available in 8 different dosage strengths and patch sizes. Make sure you have the right dose patch or patches that have been prescribed for you. 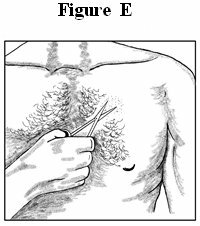 Put the patch on the chest, back, flank (sides of the waist), or upper arm in a place where there is no hair (See Figures A-D). Open the pouch: Tear at notch and remove the fentanyl transdermal system. Each fentanyl transdermal system is packaged with additional pieces of protective film above and below the patch and is sealed in its own protective pouch. 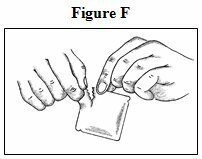 Do not remove the fentanyl transdermal system from the pouch until you are ready to use it (See Figure F). 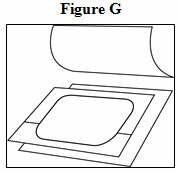 The additional pieces of protective film are discarded at time of use (See Figure G). Peel: Peel off both parts of the release liner from the patch. Each fentanyl transdermal system has a clear plastic release liner that can be peeled off in two pieces. This covers the sticky side of the patch. Carefully peel this release liner off and throw the pieces away. 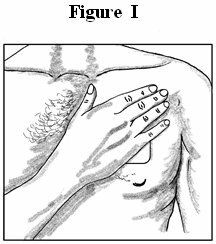 Touch the sticky side of the fentanyl transdermal system as little as possible (See Figure H). Press: Press the patch onto the chosen skin site with the palm of your hand and hold there for at least 30 seconds (See Figure I). Make sure it sticks well, especially at the edges. If the patch falls off right away after applying, throw it away and put a new one on at a different skin site. See the section below called “Disposing of a fentanyl transdermal system”. If you continue to have problems with the patch not sticking, you may cover the patch with a transparent adhesive film dressing such as BIOCLUSIVE® or Askina®Derm. These are special see-through adhesive dressings. Never cover a fentanyl transdermal system with any other bandage or tape. Remove the liner from the BIOCLUSIVE® or Askina®Derm dressing and place it carefully over the fentanyl transdermal system, smoothing it over the patch and your skin. If your patch falls off before 3 days (72 hours) of use, dispose of (throw away) properly. See the section below “Disposing of a fentanyl transdermal system”. Apply a new fentanyl transdermal system on at a different skin site. Be sure to let your healthcare provider know that this has happened, and do not replace the new patch until 3 days (72 hours) after you put it on (or as directed by your healthcare provider). Wash your hands when you have finished applying a fentanyl transdermal system. Remove a fentanyl transdermal system after wearing it for 3 days (72 hours). Dispose of the used patch right away. See the section below “Disposing of a fentanyl transdermal system”. Choose a different skin site to apply a new fentanyl transdermal system. Repeat Steps 2 through 6 above when applying a new fentanyl transdermal system. You can bathe, swim or shower while you are wearing a fentanyl transdermal system. If the patch falls off before 3 days (72 hours) after application, dispose of properly. See the section below “Disposing of a fentanyl transdermal system”. Apply a new fentanyl transdermal system on at a different skin site. Be sure to let your healthcare provider know that this has happened, and do not replace the new patch until 3 days (72 hours) after you put it on (or as directed by your healthcare provider). 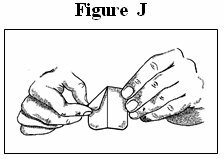 Fold the used fentanyl transdermal system in half so that the sticky side sticks to itself (See Figure J). 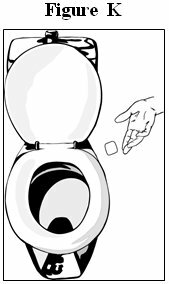 Flush the used fentanyl transdermal system down the toilet right away (See Figure K). A used fentanyl transdermal system can be very dangerous for or lead to death in babies, children, pets, and adults who have not been prescribed fentanyl transdermal system. Throw away any fentanyl transdermal systems that are left over from your prescription as soon as they are no longer needed. Remove the leftover patches from their protective pouch and remove the release liner. Fold the patches in half with the sticky sides together, and flush the patches down the toilet. Do not flush the pouch, protective films or the release liner down the toilet. These items can be thrown away in a trash can. Inactive Ingredients: Dimethicone NF and silicone adhesive. removal of the protective liner. Do not expose area to heat. See Medication Guide for important safety information. Medication Guide for important safety information.